First spied in development seven months ago, Icebreaker will arrive on the iTunes App Store next week as a hockey-style complement to Backbreaker, the football title whose "Tackle Alley" minigame saw tremendous success as an iPhone port. 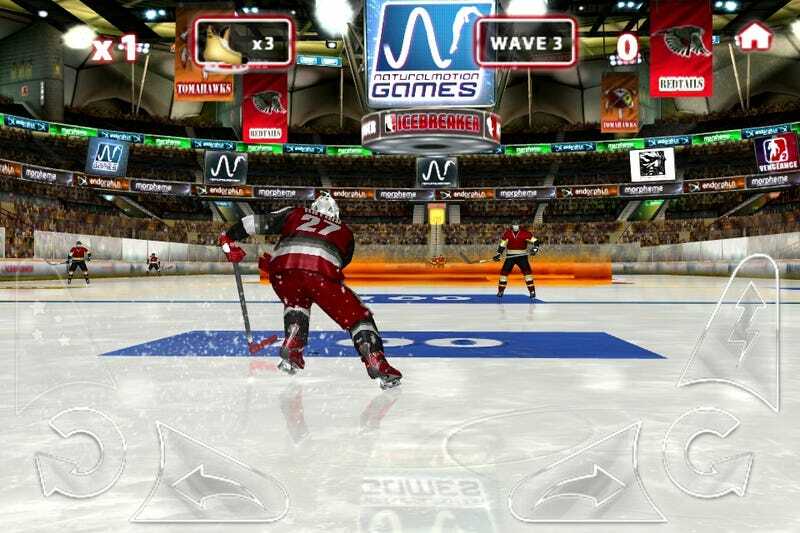 Backbreaker Studio Now Working On "Icebreaker"
Icebreaker mimics "Tackle Alley" (which became Backbreaker: Tackle Alley and Backbreaker: Vengeance for the iPhone) by pitting you as a single player against waves of defenders on the way to the goal. In this case, to finish the level, your hockey player must shoot on the goal, ideally within a certain highlighted area, after eluding his pursuers. Dekes and spins help get you by them and, of course, you're free to showboat once you're in the clear. But the game gets progressively tougher, throwing more defenders, better goalies, and tougher shooting angles. New techniques are unlocked, and become necessary, as you progress, so things like sprints, hard-stops, charged shots and board checks come into play. "One of our big focuses was to get across the feeling and flow of being on the ice; we had a whole motion capture rig set up on an ice rink overnight and captured hundred of moves," said Torsten Reil, the CEO of NaturalMotion Games. "On top of that, our Endorphin simulation technology is delivering the checks and wall smashes." Icebreaker was always envisioned first as an iOS game, according to Torsten Reil, the CEO of NaturalMotion Games. NaturalMotion's Backbreaker ports fared much better on that device than the full simulation title did on the Xbox 360 and PS3. On the iPhone and iPod Touch, Backbreaker apps have been downloaded some 5.5 million times globally. But that success and Icebreaker's iOS-only debut doesn't mean the studio is abandoning console development, Reil said. "iOS is definitely a big focus for our games division, partly because it's worked out really well for us, partly because iOS devices now have enough performance to run our console tech, so there's a lot of cool stuff we can do," Reil told Kotaku. "Having said that, we've just announced Backbreaker: Vengeance for console, which we're very excited about." Icebreaker releases June 2 on the iTunes App Store for all iPhone versions and the iPod Touch. The app is $2.99.